At Water Heaters Only, Inc we install water heaters to the current California Plumbing Code (cpc), based off Chapter 5 (water heaters) of the CPC. We also install our units to the best of our ability to codes enforced by the municipality where the water heater will be installed. Municipalities and Counties can enforce some, all of part of the California Plumbing Code. In our experience, we find enforcement of the code requirements in the California Plumbing Code varies from city to city as well as between inspectors. As licensed contractors, we perform a site inspection upon arrival to inform our customers of what areas the water heater is not compliant with the current code. We must inform our customers of the requirements of the state of California and make clear the items enforced in your area. This allows our customer to make informed decisions about their residence. Below is a list of requirements regularly enforced in the Concord Area. Location of the Water Heater: The California Plumbing Code Regulates where a water heater may and may not be installed. Gas water heaters are not approved to be installed in bedrooms, bathrooms, or closets (unless sole use). This plumbing code regulation prevents the potential of human contact with trace amounts of Carbon Monoxide (CO) released from gas water heater vents and the possibility of inhalation accidents. This is presently enforced in the Concord Area. If you have a gas water heater located in a bedroom or bathroom, see our information on Direct Vent Water Heaters. Earthquake Bracing and Strapping: Protection from seismic damage, since California is in an earthquake zone there are specific safety requirements for how water heaters must be protected from possible seismic activity. Storage type tank units are required to have certified earthquake straps on the top and bottom thirds of the tank. Inspectors in Concord enforce this regulation. 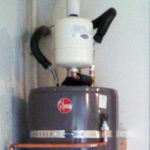 Flue Venting: Every gas water heater has a flue venting system. Some water heaters are power vented and have a plastic vent, but most traditional tank water heaters have a metal vent that attaches to the top of the unit to disperse the carbon monoxide created by the gas being burned to heat the water. The size of the water heater vent depends on the amount of BTU’s the hot water heater burns during combustion. Vents must be installed in a specific manner per the CPC for safety. Depending on the type of vent there must be a certain amount of clearance from the vent to any flammable or combustible surfaces. Vents must also terminate to an approved location. During our onsite assessment we will inspect the venting system and alert you to any pre-existing issues we see. Drip Pan and Drain Lines: For water heaters located in an area where (water) damage can occur, on a built-in platform, an inside location, attic or 2nd floor where water leakage could cause damage to your residence a drain pan with a drain line running to an approved location (usually the exterior) is required. Temperature / Pressure Relief Valve and Drain (T/P Overflow) to the Exterior: The CPC requires the Temperature / Pressure relief valve to have a drain that is piped to an approved location, most often this pipe is required to run to the exterior of the building. This is to prevent accidental scalding and damage when the T/P relief valve opens and releases water due to high temperatures or excessive pressure. This code requirement is being enforced by Concord. Dedicated Water Shutoff Valve: A water shut off valve is required at the hot water heater. The shutoff valve allows the water to be turned off on the cold water supply to the tank, when necessary, while allowing the rest of the home to maintain normal water usage. We recommend and install 1/4 turn ball style valve. Gas Valve Replacement: Older style grease pack gas valves were a common part installed with older water heater. However, due to a high failure rate, the California Plumbing Code does not approve their use any longer. Our technician will check for this valve when inspecting your hot water heater and advise that is be changed if we find one. Our technician will also inspect the entire gas line and give recommendations based on the current condition of the gas line. This item is enforced in Concord. Expansion Bottles – The California Plumbing Code has required expansion bottle on ‘closed loop plumbing systems’ for many years. A “closed loop plumbing system” is a system has a backflow preventer or a pressure regulator between the house and water main. When water is heated it can increase by about 2% volume causing pressure to build in the plumbing system, when a faucet is opened in the home it causes a rapid drop in pressure and can result in deterioration of the plumbing system in the home, fixtures and the water heater. The pressure build up can also lead to the P/T valve on the water heater opening and releasing water unnecessarily. Expansion bottles are designed to absorb the excess pressure and relieve the build up of pressure in the plumbing system. If you have a “closed loop plumbing system” we recommended installing an expansion bottle on the cold side piping of the water heater.